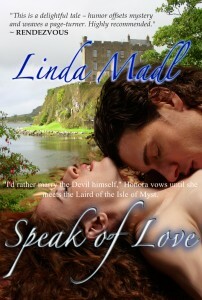 I’d like to announce the re-released Speak of Love on Kindle through Mythical Press. Why this title again? Because like you, I love a Scottish setting. On my second visit to Edinburgh one evening my husband and I walked along a country road during the long summer twilight. From a nearby glen we could hear a water fall, and beside us we could see the mist gathering over the pastureland. It gave one a chill. How easy it was to envision Macbeth’s witches at the wood’s edge chanting over a boiling kettle. From the walls of Dunvegan castle I pictured the billowing sails of a pirate ship. Sitting at a restaurant window, we admired a luminous rainbow arching across a loch. Scotland is indeed a land of inspiration for writer and reader. It is a land of brownies and elves, castles and lochs, witches, kelpies, lowlands and highlands, Jacobites and pirates. The men and women have survived invasions, occupations, and wars. Atmospheric, picturesque, and rich in history, Scotland is fascinating to research and perfect as inspiration for heroes and heroines of any age. Honora and Brec are among my favorite characters. They are strong people bent on protecting their families. After a rocky courtship and a wedding in ancient St. Giles, they journey across Scotland to the west coast, hoping to find a future in a war-torn country. But, can they find their way to each other? If you’ve not read my work before, I hope you’ll read Speak of Love.